Learn how to take some basic clothing pieces and turn them into show-stopping one-of-a-kind style. We will be cutting up and refashioning boxy t-shirts, adding hand embroidery to knits, denim and a basic skirt. 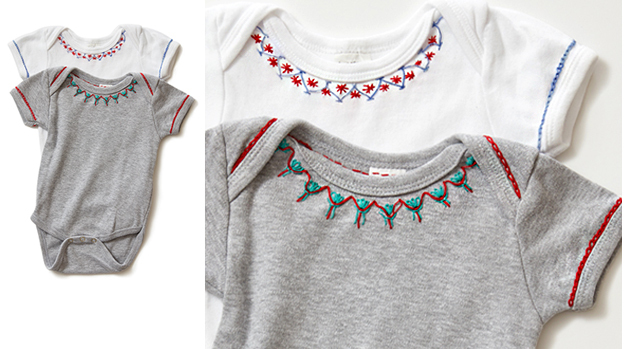 Learn how to turn some plain baby clothes into perfectly precious and "sew" special pieces. And, how to use hand and machine embroidery to take plain jeans and make them into high fashion pieces. We will also show you how to upcycle a men's dress shirt into a dress, off-the-shoulder shirt, or tunic. Upcycling and redesigning are passions for Kelly Nagel. She has been sewing and doing hand embroidery for almost 40 years and in that time she has learned lots of different hand embroidery stitches and upcycling techniques. In this class, she will share with you the tricks she has learned to make hand embroidery, embellishing and upcycling clothing, fun and easy; and they always turn out beautifully. She will also show you some tips and tricks that will save time and the key techniques to always remember when modifying clothes. In addition to all the tips, tricks and shortcuts, you also get the patterns and full step-by-step instructions for a doing hand embroidery on a t-shirt, baby's clothing, knits, men's dress shirts and a great trunk show that will inspire you to find your own drab clothing and make them all fabulous in your own unique style. Bonus: Kelly is joined by Laura Pifer, a popular seamstress, blogger and habitual upcycler, who writes the blog "Trash to Couture". She will show you how to upcycle men's dress shirts, and she shares several of her own drab to fab creations in the trunk show. Learn about the right tools for doing hand embroidery and embellishing clothing, and why each one is important. 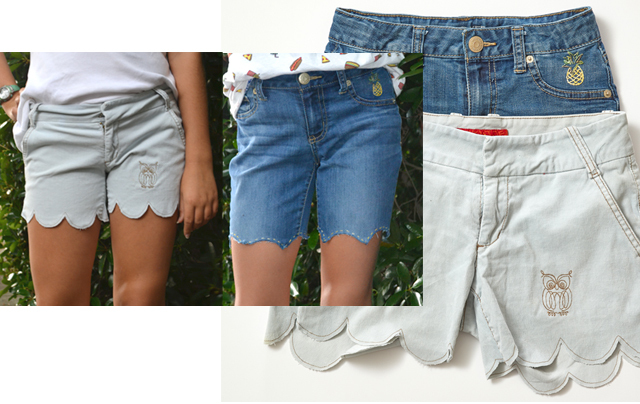 Learn how to upcycle jeans into shorts, and add embellishments for a more trendy look. Get to know Laura Pifer from the popular blog "Trash to Couture". 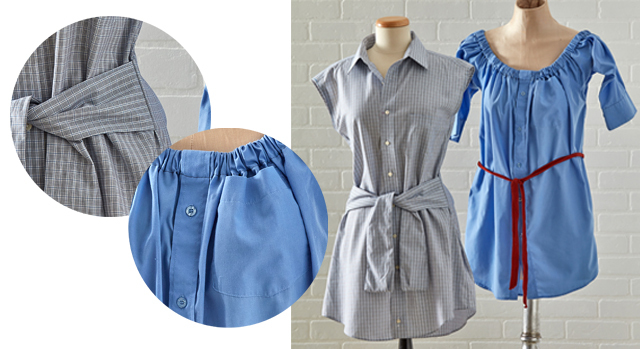 She shows you how to take a men's dress shirt and turn it into your favorite dress or tunic. Learn how to turn simple baby clothing into one-of-a-kind pieces that both baby and mom will love and treasure. You can sign in and read the materials, watch the videos, DOWNLOAD THE MATERIALS AND VIDEOS TO KEEP FOREVER and work at your own pace, whenever and wherever you want to. We'll be here every step of the way to help you with any questions or problems during the course. You can submit photos of your projects through the course for our input and suggestions, too. Share ideas, questions, and comments with fellow students within the course, if you want to. The basic tools and supplies you need for successful and stress-free sewing. 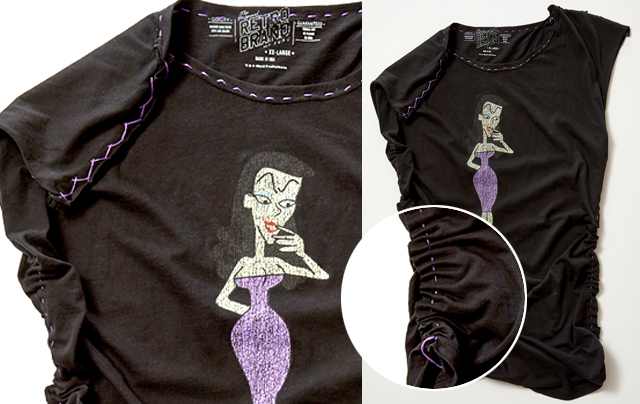 Full instructions and stitch guide for cutting up and hand sewing on t-shirts and knits. Full instructions, and several inspirational options, for turning a men's dress shirt into a dress, off-the-shoulder shirt, tunic and more. An inspiring trunk show by Kelly and Laura Pifer of Trash to Couture to show you lots of ways you can use the techniques you learn in this class in a variety of different projects. Kelly shows and describes what supplies you need. 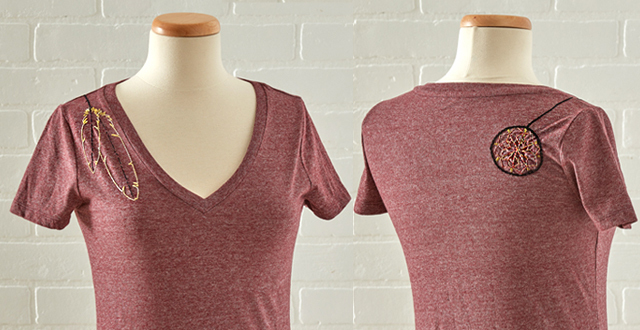 Learn how to cut up and sew a boxy t-shirt back together for a lovely personal fitting t-shirt. Learn some basic hand embroidery and flattering detail. How to use stabilizer instead of pins. How to ensure your hand stitching doesn't pucker. How to do Ruching by hand. How to start your hand embroidery without tying a knot. How to use embroidery stitches to give added interest and detail. Learn some basic hand embroidery stitches and technique. Learn how to transfer a design without tracing. Learn how to stabilize knits for hand embroidery. Learn how to do hand embroidery with metallic thread. Learn how to pick the right shirt to upcycle. Learn how to cut and sew the shirt to fit your body. Learn how to use all the parts of the shirt and reuse them to make the belt or add details to the dress. Learn basic Hand Embroidery stitches. Learn how to stabilize knits for better stitching results. Learn key places to add Hand Embroidery for the biggest impact. Get lots of different ideas and inspiration from both Kelly Nagel and Laura Pifer on ways to embellish, upcycle and redesign clothing to take it from drab to fabulous. This online course is designed to fit into even the busiest of schedules! The course has no set meeting time. It is available to you anytime from 9/29/17 or whenever you sign up thereafter, day or night, for one full year. And because we include full-color, step-by-step downloadable written directions, and step-by-step downloadable videos to accompany each technique, too, you can practice the techniques again and again anytime in the future, long after the year is over. And the price point is unbeatable!